Nay Pyi Taw – The leader of the Rakhine National Party hopes to return to local politics via the next by-election to help his party run the strife-torn Rakhine State where more than 160 people died in communal violence in 2012. 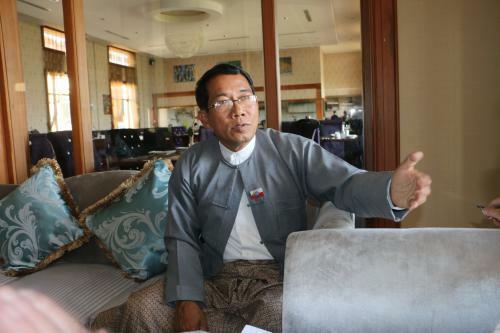 “I will try again, maybe in the next by-election,” Rakhine National Party head U Aye Maung told Frontier on Thursday. U Aye Maung, a member of Myanmar’s current Upper House, lost his seat in the November 8 general election but remains a key leader of his party that has run on an anti-Muslim platform in his home state. The Rakhine National Party won 23 seats in the Rakhine State, compared with the National League for Democracy’s eight seats and the pro-military Union Solidarity and Development Party’s four seats. It was one of the few states where the NLD did not win in the November polls. Countrywide the NLD won more about 80 percent of the contested seats, giving them the majority they need to pick the next president, who will have sweeping powers in appointing government ministers and heads of government organizations. The RNP is hoping that the next president will appoint a candidate from their party as Rakhine Chief Minister, heading the local government. As U Aye Maung lost his Rakhine seat, he is no longer eligible for the post, but another party member could get the post. “I will sit behind the chief minister, not above,” U Aye Maung said. Daw Aung San Suu Kyi, the leader of the NLD, is blocked by the constitution from becoming president because her two sons are British nationals. In a speech before the November 8 polls she famously said she would be “above” the president if the NLD wins. The communal violence in the Rakhine will pose a challenge for the next government and whatever party is running the state. The Rakhine was the scene of bloody communal fighting between Buddhist and Muslim populations in 2012, resulting in about 160 deaths and tens of thousands displaced. At the root of the problem is a debate over the term Rohingya which many Rakhine Muslims call themselves to demonstrate their ancient claim to citizenship in Myanmar. The Buddhist Rakhine population, however, classifies the Muslim community as predominately of Bengali descent from neighbouring Bangladesh. He was unclear about the fate of the remaining 50 percent, who might not be able to prove that their families have lived in the Rakhine for three generations prior to independence in 1948, a requisite for Myanmar citizenship for people of Indian or Chinese descent under existing laws.